Nothing inspires me more than watching teenagers make an impact in our world. These five young ladies decided to start a Girl Up club to support girls’ empowerment in developing countries. In the process, they learned a lot about themselves and how much of a difference they can make in their communities. 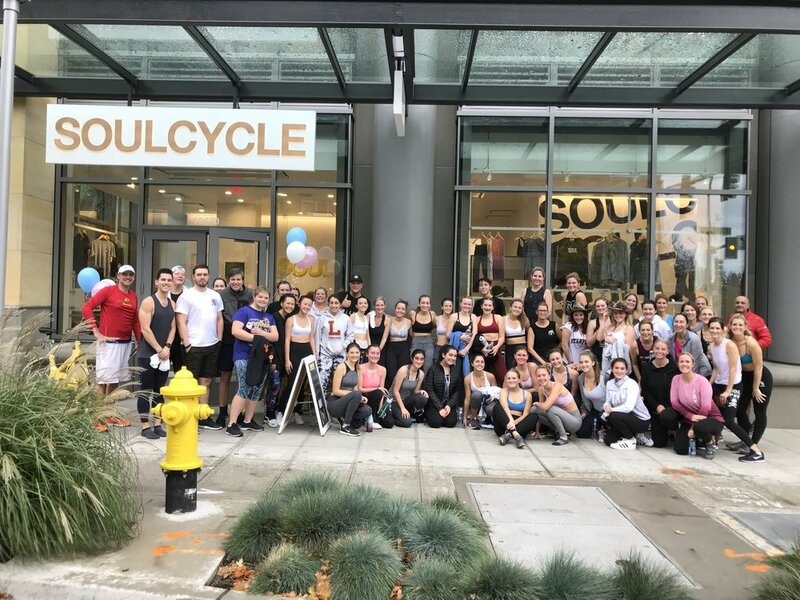 What started as a group of 5 core members - Quinn (15), Sarah (16), Nathalie (16), Layli (16) and Audrey (15) - is now a group of 26 members who span across Seattle, Bellevue, and Mercer Island. These girls are organizing events, hosting fundraisers, and raising awareness around the importance of gender equality worldwide. Tonight (August 14, 2018), the girls are the featured non-profit at the Downtown Bellevue Movies in the Park where they will be sharing more about their chapter of Girl Up and the impact this organization has for girls everywhere. Below, read in their own words how Girl Up has made a difference in their own kindsets. All I have to say is our future is bright. Go girls! Q. In your words, what is Girl Up? Answer: The best way we can describe Girl Up is that it is a “for girls by girls movement”. A common misconception about Girl Up is that is it solely working to help girls in developing countries. As important as that element is, we can’t express how much of an empowering experience having our club is for ourselves. Fundraising and helping other girls makes us feel confident and powerful, emphasizing how Girl Up is really for every girl -- no matter your socioeconomic status, geographical location, or anything else. Through our Girl Up club we are able to recognize the impact we have had on the world around us as well as how we have grown and matured as citizens of this world. Q. What made you decide to start this chapter of Girl Up? Answer: Sarah, Quinn, and Layli all attended an information session about Girl Up in our neighborhood in 2016. At this event, we heard from a former Teen Advisor of Girl Up and President of a successful club. We learned about what Girl Up does and what it is really all about, inspiring us to start our own club the following year. Seeing how normal girls just like us were able to run their own club and have such success showed us how attainable having our own club would be and gave us the confidence to get started. In addition to watching other young girls work with Girl Up, all the core members had a strong understanding of the importance of empowering and educating young girls, but we needed a platform to make difference. Q. You are all from different schools/grades - how did you find each other? Why was it important for you to do it with people outside of your school? Answer: When starting our club, we (Quinn and Sarah) knew that we wanted it to be outside of our school because of the strict fundraising policies and limited meeting times. We reached out to girls we knew that felt as passionate as us, and quickly created the core of our club which includes Nathalie, Layli, and Audrey as well. Creating a broader community of core members has allowed us to reach wider networks, contributing to our success. Having a club consisting of girls from different schools and grades has enabled us to get a wide variety of opinions and experiences with teen empowerment and also gives a longer lasting sense of friendship and knowledge as the club continues to grow. Q. Why is Girl Up important to you and why do you want to spread the message? Answer: Quinn’s personal experience with girls’ education has created a strong passion for empowering girls all across the world and has been a large motivation for co-founding her Girl Up Seattle Club. As her mom co-founded an all-girls high school in Rwanda, Quinn was given an opportunity to see the challenges a young girl can face in a developing country. She also saw the impact that education can have. Also being girls in high school, we have also seen the challenges girls can face even in our own communities. Creating awareness and including boys has been a main mission for our club as we see it very important to include everyone’s opinion on the way to change and equality. Q. What are some of the projects/events that you have done together? Answer: One of our clubs most successful events was a SoulCycle fundraiser that raised money for bikes for girls to ride to school in Malawi. Our club raised over $12,000 which was over 10% of the main fundraising goal for all the girl up clubs. During this event our club was faced with the challenges of budgeting and spreading the word to make sure our event was the most successful it could be. We also did a cooking event around Valentine’s Day to raise awareness on self love and teen suicide prevention. This was a very small event that helped develop an understanding of teen wellness. We were able to hear words from friends of victims of teen suicide and practiced the idea of self care. Most recently, we held a an outdoor screening of the movie Girl Rising. We had a very impressive turnout and raised over $2000. We felt that this was extremely successful because of the important topics of the film, and how we were able to spread awareness of human tracking, girls education, and overall issues in the developing world to our community. Q. Tell us more about the Movie Night in the Park? How did that idea come about? What did it take to organize this event? Answer: The Movie Night in the Park is organized by the City of Bellevue, and they choose 8 organizations to be the featured non-profit for each movie night. Girl Up was chosen as one of the non-profits, and it has been a smooth process as the City of Bellevue has everything set up in an easy way to plan. Girl Up will have a table at the movie to help others learn more about the organization and also give an opportunity for anyone that wants to get involved. Our main goal is to spread an awareness of Girl Up and get our community more involved. Q. What advice would you give to others who want to start at Girl Up group and/or any thing for a cause they are passionate about? Answer: Our advice is to just start. Get a group together and just start doing what you want to do! Our first event was one of our biggest events yet. We knew we wanted to have a charity ride, but were hesitant for that to be the first thing we did. Once we couldn’t think of anything else, we decided to just pursue it since we knew it was a good idea. It turned out to be super successful and really set the tone for our confidence as a club. It was definitely a risk that paid off! Q. What's the greatest thing you've learned about yourself and each other since doing this? Answer: A major theme for all of us throughout this process is confidence. A year ago, we were all very intimidated by the prospect of having big events and projects like we do now. Once we started to plan, host, and execute more successful events we gained a ton of confidence that has allowed us to grow as individuals and as a club. We now feel like we are unlimited to what we can do with our club, community, and Girl Up as a whole.